Magnum Managed Networks Software (MNS), combined with a Magnum 6K Series Switch, provides flexibility, power, and efficiency in a managed Ethernet platform. MNS-6K-SECURE provides premium security capabilities for environments demanding extra security. A full range of industry-standard software functions in the MNS-6K software product line enables the versatile Magnum 6K Switches to perform efficiently in a wide range of managed LAN applications, including redundant topologies. Both GUI and CLI available. Graphical User Interface: "Cradle-to-grave" GUI operation, GUI configuration options, User-based Access Control, Export Log, Auto Boot Mode, Editable System Prompt, easy save and load of configs, FTP/TFTP and more. SSH/SSL Access: Encrypts information as net traffic moves; for web-based and remote users. TACACS / RADIUS: Access to a switch via authentication from a TACACS server; Access to the network via RADIUS server authentication. VLAN Support: Additional support for up to 256 VLANs. RADIUS IEEE 802.1x - For network access control, RADIUS provides a means of authenticating and authorizing or preventing users and devices attempting to attach to LAN ports, providing secure access to a network. TACACS+ (Terminal Access Controller Access Control System) - Provides access control for networked devices including switches with MNS-6K-SECURE. TACACS+ provides a centralized means to control which users can access which device on the network. Remote Access Security - Remote access via SNMP, web (HTTP) and Telnet can be controlled by administrators of MNS-6K-SECURE. Authorized IP addresses can access the switch, providing additional remote access security beyond traditional capabilities. QoS, IEEE 802.1p - MNS-6K-SECURE supports packet prioritization (QoS) per port, TAG, MAC address and IP address. Syslog - Compliant to RFC 3164,Syslog allows the logs from 6K switches to be consolidated to centralized servers. These logs can be analyzed by system administrators for suspicious activity on the network. SSH - Like Telnet, SSH enables access to the MNS-6K-SECURE console functions for a remote user, encrypting all the information transmitted, thus eliminating sensitive information (such as passwords) being transmitted in clear text. SNTP - Supports 6K as a time source for network devices to synchronize time across multiple devices. Simplifies time synchronization for video servers used in surveillance, as well as Syslog, event log, and other general time-stamped data. Secure FTP - Allows upload and download of configurations and scripts to be encrypted with secure certification from a Secure FTP Server. DNS Client - Allows MNS-6K-SECURE users to access other devices using logical names instead of IP addresses. Avoiding explicit IP address information prevents spoofing attacks, thus providing additional security. TFTP Server - An MNS-6K-SECURE switch can be a TFTP Server in the network, thus providing services to update software and other information like host names and host IP addresses. This allows managers to easily update switches to the latest software. DHCP Server - An MNS-6K-SECURE switch can provide IP addresses to devices requesting that information via DHCP. This allows system managers insight into devices on the network and eases deploying and controlling devices. DHCP server implementation based on RFC2131. Granular Control of Configuration Access - Like multi-level login, users of MNS-6K-SECURE can control what groups of information are visible to users. This provides an added layer of security. 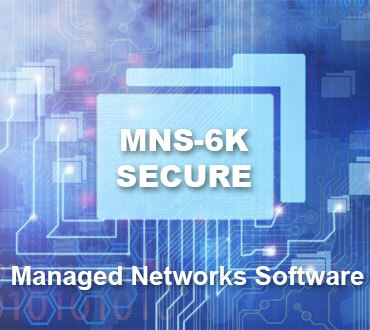 MNS-6K-SECURE users have the option to set the User Privileges for modules and commands. Additional Users - MNS-6K-SECURE provides capabilities to add up to twenty users, thus avoiding password sharing among users. Welcome Message (Message of the Day (MOTD)) - MNS-6K-SECURE allows system administrators to modify the welcome screen, providing an additional deterrent against abusive users.